Boston University struggled early on, falling behind 3-0 to a River Hawk team that was 1-13 last season. 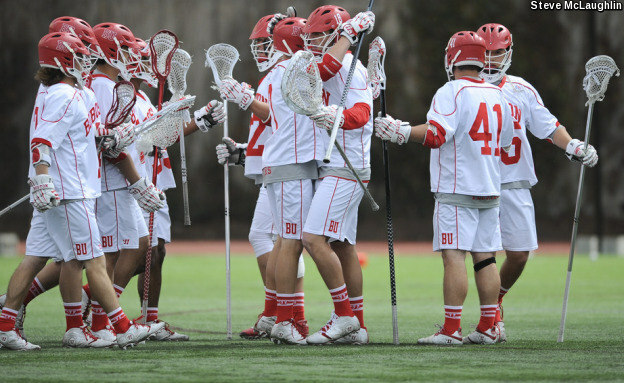 James Burr, a freshman attackman, finally got the Terriers on the board before the half, and from there, BU took the momentum. The Terriers went on to win 8-5 behind four goals from Burr and two from sophomore Jack Wilson, despite Ryan Hilburn missing the game with injury and Cal Dearth leaving early. Freshman Tristian Rai scored four goals as Lehigh held tight with No. 3 Duke throughout the game, point making it a two-goal contest before falling 13-11 on Sunday. Lehigh, a team decimated by graduated players, had several question marks this season but was able to play well against one of the best teams in the nation. Adam Sawicki made eight saves in his first start as the Lehigh starting goaltender, but the Mountain Hawks start their season 0-1. If there was any result in the Patriot League this week that should scare supporters of other teams, it should be this one. Loyola, ranked 11th in the nation, travelled to Charlottesville to face the No. 7-ranked Virginia Cavaliers and held them to four goals. Greyhounds goalie Grant Limone led the way with 14 saves to help Loyola defeat one of the toughest opponents of any PL team this season. In what was likely the biggest victory in the history of the program, Michigan took down Colgate 9-8 on Sunday afternoon. Kyle Jackson scored four goals to lead the Wolverines, while Peter Donato and Chase Wittich scored two goals each in the loss. Gerald Logan impressed in net for Michigan, making 15 saves against the Raiders. Michigan won the turnovers, faceoff, and groundball battle to give Colgate its first loss. Eight different goal-scorers led the way for the Black Knights as they outpaced UMass 9-5 on Friday. Nate Jones led the way with three points overall as Army picked up its first win of the season and its first victory in the post-John Glesener era. AJ Barretto made three saves for the Black Knights as he became the first rookie starter for Army since 1991. The Bison won their second game of the season when they went into Bryant and pulled out an 11-10 victory. Will Sands, Connor O’Hara and Kyle Shannahan each scored two goals. Christian Klipstein made ten saves in the victory over Bryant to improve its record to 2-0. O’Connor scored the game winning goal in the fourth quarter. Jason Sands had four assists despite the loss for the Leopards to open their season. Ben Falcone made 13 saves despite the 12-8 loss, and two goals each were scored by Will McCarthy, Connor Dehnert and Kevin Lewis. Sacred Heart had hat tricks from two players, and the Leopards, projected to finish last in the Patriot League, open the year 0-1. Providence rebounded from a loss to another Patriot League team, Boston University, to defeat Holy Cross 12-8. Will Mazzone broke out to score six goals against the Crusaders, while Holy Cross was led by Conor Sofield who scored three goals and a two point night from Jon Vogel. Michael Ortlieb made 12 saves for a .500 save percentage.